One of the partnership’s key objectives is to develop and adopt advanced techniques to increase oil recovery, including polymer and surfactant flooding*. As an initial step, the companies will launch a feasibility study for surfactant flooding at the Sutorminskoye field (Yamal-Nenets Autonomous Area). Based on the results of this study, the parties will decide on pilot tests before moving to potential field-wide application, after which the technology can also be deployed at other assets of the Company. Gazprom Neft has a successful track record of using polymer and surfactant flooding at its assets. This approach proved highly effective at the West Salymskoye field in the Yamal-Nenets Autonomous Area, enabling the oil recovery rate in a depleted area to increase to 69%, of which 17% was a direct result of the flooding. 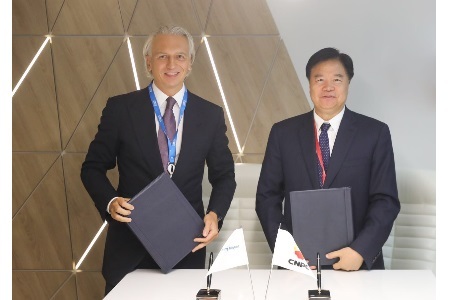 The joint initiative of the Gazprom Neft Science and Technology Centre and CNPC is in line with the Company’s focus on the latest technologies of enhanced oil recovery that make it possible to tap into the hard-to-reach reserves at mature fields. Gazprom Neft is a vertically integrated oil company primarily engaged in oil and gas exploration and production, refining, and the production and sale of petroleum products. Gazprom Neft’s corporate structure encompasses more than 70 exploration and production, refining, and retailing enterprises in Russia, the CIS and worldwide. The company’s proven and probable reserves (SPE-PRMS) are estimated at 2.78 billion tonnes of oil equivalent (btoe), making Gazprom Neft one of the 20 largest oil and gas companies worldwide. Gazprom Neft is also a Top 3 company in Russia in terms of production and refining volumes. Total production in 2017 amounted to 89.75 million tonnes of oil equivalent (mtoe), with refining volumes of 40.1 million tonnes. Gazprom Neft’s products are sold throughout Russia and exported to over 50 countries worldwide. The company’s filling station network has more than 1,850 stations throughout Russia, CIS and Europe. China National Petroleum Corporation is China’s largest state-owned oil and gas company. Its businesses include exploration, production, transportation and storage of oil and gas, as well as refining and chemicals and R&D operations. CNPC and its subsidiaries account for 34% of domestic oil supplies in China. The company is involved in more than 90 international projects and controls 63% and 37% of the domestic gas and oil product markets, respectively. CNPC employs over 1,400,000 people. *Flooding, currently the key technology in the development of hydrocarbon fields, is implemented by injecting water into the field through injection wells. As water flows through the reservoir, it displaces hydrocarbons towards production wells and thus contributes to considerably improved efficiency of operations. The flooding technology can be further enhanced by adding surfactants and polymers. Surfactants provide for better displacement of hydrocarbon particles, while polymers increase water viscosity, helping to push oil towards production wells in a more uniform fashion. The creation and production of flooding surfactants and polymers is one of the most promising areas in the Russian oil industry.